Uber Technologies Inc. has started a trailer leasing and rental business to support drop-freight opportunities for carriers and shippers using its Uber Freight load-matching network. With its new Powerloop subsidiary, Uber aims to build out a national trailer-pool system that will reduce driver detention time while providing shippers with additional truck capacity from small carriers. Powerloop is a sister company to Uber Freight, which offers a mobile app that drivers can use to find and book loads on their smartphones. The Uber Freight app primarily is geared toward small fleets and owner-operators. Now that it has added trailer rental to its trucking ventures, Uber believes it can further improve driver productivity. Given the current capacity crunch and the electronic logging device mandate, drivers’ hours are more important than ever, said Max Pike, Uber Freight’s program manager for special projects, including Powerloop. By simply dropping trailers at their destinations and picking up preloaded trailers instead of waiting to unload, carriers can earn more and make better use of their driving time under hours-of-service limits. “Carriers are focused on spending as much time as possible on the road moving freight, and not sitting at shippers’ and receivers’ facilities,” Pike said. Powerloop is designed to extend drop freight to small carriers that generally have been excluded from those opportunities because they lacked the necessary number of trailers or were too small to develop relationships with the large shippers offering this freight. “Because of Powerloop, now we’re able to unlock a lot of this drop-freight volume that originally we weren’t able to do,” said Kofi Asante, who heads Powerloop’s product strategy. In our fifth episode of RoadSigns, we ask: How far can we go in terms of automating freight transactions? Hear a snippet from Ziad Ismail, chief product officer at digital freight matching firm Convoy, and get the full program by going to RoadSigns.TTNews.com. Convoy, another digital freight broker, also introduced a “power-only” program and universal trailer pool earlier this year for carriers using its load-matching app. At launch, Powerloop is focusing first on operations within Texas. From there, Powerloop intends to build out its network to surrounding states and then add more markets in 2019, Pike said. 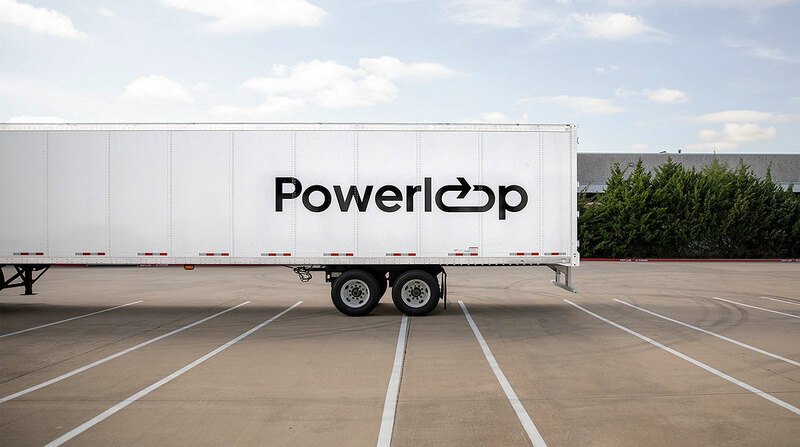 Powerloop’s eventual goal is to help create a single, interconnected trailer-pool system in which shippers can implement drop operations as needed and eligible carriers of any size can move those trailers anywhere in the country. The company would not disclose how many trailers Powerloop offers for rental, but that number is “in the hundreds,” Pike said, adding that the company plans to expand its trailer fleet in the months ahead. At least for now, Powerloop offers only dry van trailers. Powerloop does not own the trailers, but is leasing them from undisclosed companies. Uber said its new trailer-pool business already is being used by a handful of Fortune 500 shippers, including beer giant Anheuser-Busch. “At Anheuser-Busch, we believe that a universal trailer pool program, such as Powerloop, is an innovation that is long overdue for the industry,” Ties Soeters, vice president of logistics procurement, said in a statement. Less idle time for drivers also helps reduce emissions, Soeters added. To book drop freight through Powerloop, carriers first must sign up for Uber Freight and undergo its onboarding process, which includes ensuring that they have a safe driving record and requisite insurance. From there, carriers can sign up for Powerloop at uberfreight.com/powerloop.